In Stock,Can Ship Same Day! 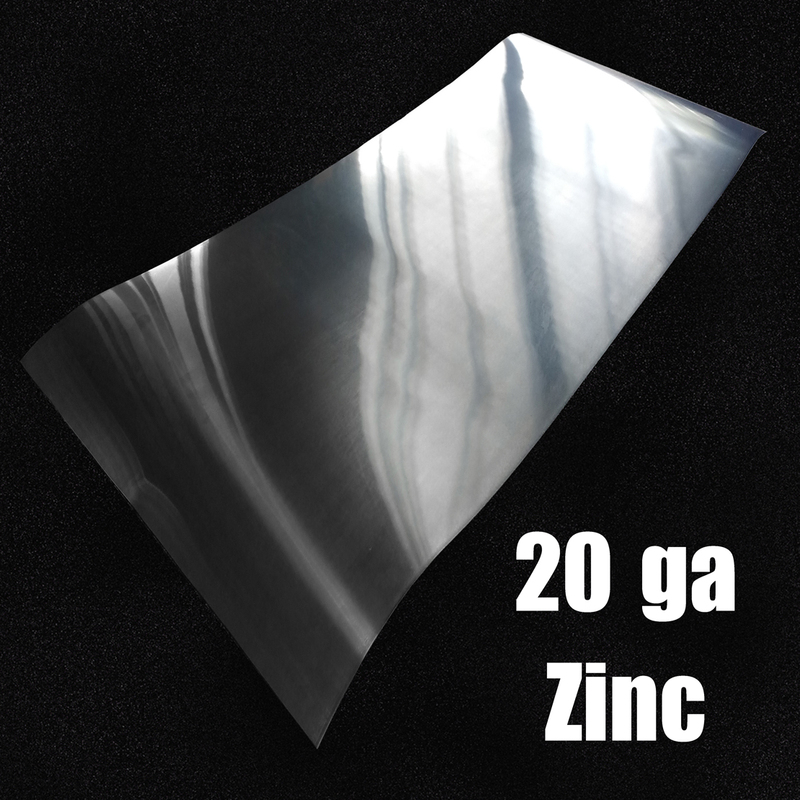 Part Number:Zinc Sheet 20 Ga-44.7"
Great for countertops, range hoods, Back Splashes, Table tops and more! Ships rolled via UPS in an upright box. For flat (LTL) shipping, please call! 20 gauge (0.030”) Zinc Sheet is durable and will stand the test of time. Easily cuts with tin snips or a metal cutting shear. To give you an idea of how thick 20 Gauge is simply reach for your wallet and grab one of your credit cards. Our 44.4" wide Zinc Sheets are offered in custom lengths sold by the linear foot. 20 Gauge (44.4” Wide) Zinc Sheets weigh roughly 4.12 lbs per linear foot. Zinc Sheets can be adhered to a substrate using our Sikaflex 1A. Surface protection depends on if you patina the sheet or if you choose to let it patina on its own. If you choose to use artificial/chemical patinas then sealer is highly recommended. If you choose to let it patina naturally then do not seal the sheet as expose to the elements is required for the patina to develop. If you have chosen to keep the natural shine on your zinc we do recommend sealing it as this will not allow for the patina process to continue. Examples of installed zinc can be seen here. A sample pack is a available. Please email zipmetals@gmail.com Please be sure to include you name, address and what samples you would like. Which Zinc is right for me! Check out our Recommended Applications chart here. Though we ship our sheet with the upmost care they are subject to “some” edge curling while in transit. Curling is usually limited to the edges. This is not usually covered by UPS therefore we like to warn you to get a little wider sheet than you need to allow for this to possibly occur. Do you need your zinc without any damage, ship it LTL freight. LTL freight is the only way to ensure the zinc you get is damage free. If freight shipping is something your interested in, please give us a call so we can provide you with a live quote. Crate/pallet fees will apply. Some “light” surface marks/scratches may appear in the zinc, these are easily removed using a scotchbright pad or 0000 steel wool.